Peer5 integrates with Android very well and integration is straightforward and easy. We have integrations for hybrid apps, PWAs, React Native apps and of course native Android applications. This document covers all forms of this integration. Android TV and set-top boxes are also supported in the SDK. If you have questions about integrating with set-top boxes or would like to discuss case studies and see if it makes sense for your business please do not hesitate to Chat with us or send us an email. Since a hybrid application is just an HTML5 application in disguise, Peer5 will work out of the box with hybrid applications. In the same page or view in which you initialize your video player - include the Peer5 scripts. Delivery of P2P content will work on all Android versions from 5.0 and up (versions with WebRTC support). Integration through React Native depends on whether you're performing video playback using an HTML5 player or a native player. If you're using an HTML5 player, please follow the web integration instructions. For native playback, please follow the native application instructions below. See our dedicated PWA docs. Peer5 has a thin native Android SDK that is embeddable in your native app. The Peer5 Android SDK works with any Android player although we recommend ExoPlayer which we've found to give good playback results. Player requests for video segments (.ts files) are intercepted and instead of always serving them directly from HTTP, they are load balanced between HTTP and P2P. That’s all that’s needed for you to get started! Q: How can I check that the SDK is integrated correctly? A: Go to https://app.peer5.com/analytics and under “+Add Filter" select dimensions.platform.name and then enter 'Contains' and then "Android". After correct integration you should be seeing traffic there. Traffic may take several minutes to start appearing in the dashboard. 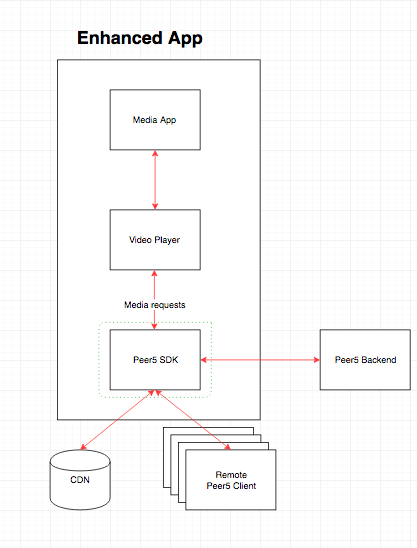 Q: How can I gradually deploy P2P with the SDK? A: You can change the amount of traffic you’d like to go through peer-to-peer from your Peer5 dashboard at https://app.peer5.com/deployment - note that this change can be made even after your have deployed your app. Q: How can I change how Peer5 runs on cellular networks? Q: Is the SDK stable? Should I expect any performance difference in my app? A: Peer5’s Android SDK is battle tested both in real world applications and contains an extensive test suite that runs on each version. Integrating the SDK should have no performance impact on your application. Users, on the other hand, will enjoy higher quality streaming with the SDK. Q: How does Peer5 work? Q: Is Android TV supported? A: Yes, Android TV is a supported platform for the SDK. However, if you intend to integrate the SDK into a custom set-top box please let us know so we can ensure compatibility with custom versions of Android. Q: Are encryption, DRM and https supported? A: Yes, HTTPS, DRM and encryption are supported on newer versions of the SDK (2.1+). However if you’re concerned about your setup please contact send us an email and we'll help you make sure it's compatible. Q: How long does integration take? A: The code integration typically takes less than an hour. After the initial integration, Peer5 will run performance tests on your stream to optimize for P2P efficiency. We might contact you and suggest minor modifications in how your server streams HLS during this optimization process. If you have any questions about applying or integration do not hesitate to Chat with us or send us an email.